Since IDA's DocuClub was relaunched in 2016 as a forum for sharing and soliciting feedback about works-in-progress, many DocuClub alums have premiered their works on the festival circuit over the past few months. In an effort to both monitor and celebrate the evolution of these films to premiere-ready status, we reached out to the filmmakers, as they were either winding their way through the festival circuit, or gearing up for it. In this edition of "The Feedback," we spotlight director Alina Skrzeszewska's Game Girls, which she presented at DocuClub LA in January 2017. We caught up with Skrzeszewska via email in the days preceding the film's Berlinale premiere. This interview has been edited for length and clarity. Synopsis (courtesy of Berlinale program): Skid Row in Los Angeles is the infamous 'homeless capital' of the USA. Anyone who is trying to learn the rules of the game and survive here has a really tough time, as the stories of the two protagonists of this film, Teri and Tiahna, reveal. Life for this lesbian couple is a constant round of prison, alcoholism and drug peddling, but there is hope, too. Their biographies are typical for the lives of Afro-American women living on the edge of American society. During a workshop initiated by the filmmaker for women in this community, they address their memories and their traumas and embark on a process of transformation during which they come into view as self-determining subjects rather than as victims. Social protests against homelessness in the neighborhood, or the 'Black Lives Matter' campaign are just as much a part of their lives as is the matter-of-fact way in which they choose to live as lesbians, or their bitter struggle with the authorities for their own four walls. 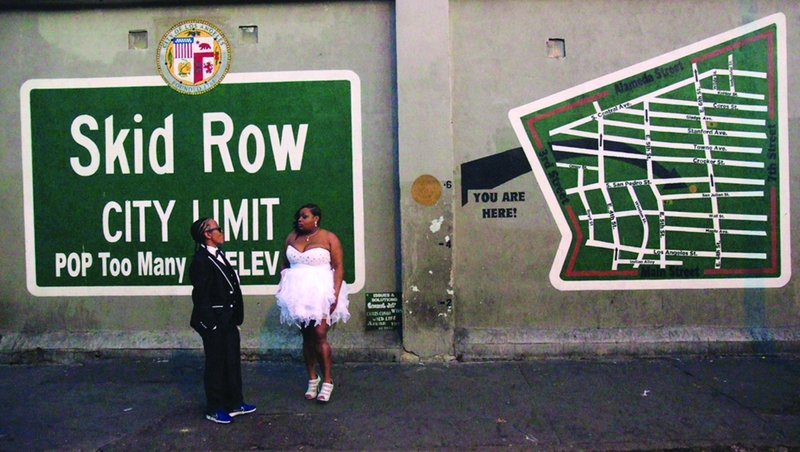 The film's intimate, observational camerawork helps tell the story of two women who manage to escape Skid Row but who are nonetheless bound by the constraints of their environment. This is a film (in part) about the workshop process, and DocuClub is a kind of filmmaking workshop. What were your expectations going into the DocuClub screening of Game Girls? I was basically curious to see what the reaction would be. It was a test. I knew the film wasn't finished, but it was difficult to see what it was that we had at that point, so we needed some outside eyes. I was open to whatever the experience would be. Was there something special about screening Game Girls in front of a Los Angeles audience? It was crucial that it was a Los Angeles audience. I specifically wanted feedback from people who were local, who could understand the movie from that perspective. The main producer, as well as the editor of the movie,Social were French, so it was a specific concern of mine to keep that local perspective, while also making it interesting for people elsewhere. What were the central challenges in your film that you felt could benefit the most from a work-in-progress screening? At a certain point during the editing process things can become a bit blurry. You don't know anymore what works and what doesn't, what to throw out, what to keep, and what you shouldn't have thrown out. You've seen the footage too many times. You lose the big picture. When I get to that point, I like to show the edit to people who don't know anything about the project. Their reactions jostle me out of being stuck. The critical ones in particular stimulate new thinking for me. So in a way the challenge at that point was to even pinpoint where the challenges were in the edit. Probably that we hadn't gotten as far as we had thought. Despite so many really strong scenes, the movie as such was not yet working. It became clear to me that we had reached a dead end with the structure we had conceived for it. We had basically taken the structure as far as we could, but it hadn't become a movie. So I had to step back and then radically change the whole thing. The true takeaways from the screening actually took some time to sink in. What audience observations did you find most surprising and unexpected? I was really surprised how many people had difficulties recognizing the main characters, as well as everybody else, over the course of various scenes. At that time, the scenes taking place in the workshop were in black & white, alluding to a sort of separation between the outside world and the world of the workshop. But the black & white became an additional hurdle for the audience. So I ended up getting rid of that idea later on. The problem became much smaller in the next cut, but I still get the sense that there's an audience bias in terms of recognizing people of color versus white characters onscreen. We're seeing some changes in the film landscape now, so hopefully this bias will start to disappear. I didn't end up going back into the editing room for a number of months, because I had a baby and we were waiting for funding. But taking a break turned out to be a great idea. It helped me find a new perspective. Once I started editing again, I changed the structure completely. There were also some new developments in the protagonist's life that helped me see the story from a new vantage point. It's an entirely different film now. We got rid of some supporting characters, as well as a few scenes inside the workshop, and we focused fully on the story of Teri and Tiahna. Instead of the black & white in the workshop scenes, there is extra-diegetic music to give them this other quality within the structure of the movie. I think it works much better this way, and - interestingly - having this music in the edit now actually feels closer to the authentic experience in the workshop. The allocated editing days were all gone, and the our final deadline for the Berlinale was here! Sort of. But no, once we had the new structure, it was clear to me that the film was finding its form. It was a gut feeling. We had to work very fast at the end. I still made a major change on the last editing day. I could have continued to play around in the fine cut, but the producers basically stopped me at that point. There wasn't any more time. Now the film is here, sitting and waiting to be brought to life by the audience.